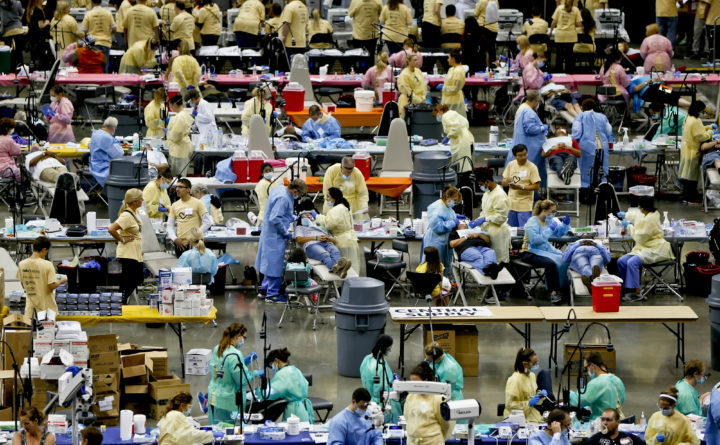 Some of nearly a thousand volunteers work on patients during the first of two days of the Mission of Mercy Pittsburgh program to provide free dental care to people from the region on the floor of PPG Paints Arena, Friday, June 29, 2018, in Pittsburgh. Mike Andrei’s wife Sheila doesn’t have dental insurance, so when she needed emergency dental surgery in December, he went to the cheapest place he could find. All of Sheila’s teeth were removed and the Auburn couple was billed $7,200. Andrei told told Maine lawmakers last month that he is paying the bill on a three-year payment plan at 26 percent interest. Although the couple’s annual income is only $13,000, he told lawmakers that he’ll somehow find the $1,700 needed to buy dentures for his wife so she’ll go out in public again. Andrei’s testimony shows how illogical it is that medical insurance applies to every part of the body except the mouth. There are currently several bills before lawmakers that would expand dental coverage to more Mainers. Two bills, that were subject to public hearings before the Legislature’s Health and Human Services Committee last month, focus especially on those with low incomes, who are more likely to report poor dental health and more likely to cite cost as a reason for skipping dental care. One, LD 230, would extend dental care to many adults covered by Medicaid in Maine. A more sweeping bill, LD 519, would also expand Medicaid dental coverage in Maine, while also requiring private health insurers to include comprehensive dental coverage and requires dentists to provide more free and reduced cost care to Mainers without insurance. Extending comprehensive dental care to low-income Mainers is a good place to start. Concerns about a broader expansion — especially about the cost of adding mandated dental care to employer-provided insurance plans — need to be addressed before moving forward with that more extensive reform. More than a third of Americans lack dental insurance. As a result, far too many Americans go without routine dental care, which creates a need for more costly and painful care for dental emergencies down the road. In Maine, dental care is the number one reason that young people seek emergency room care. Lack of dental care also affects the employability and social interactions of low-income Americans. Federal law requires that state Medicaid plans cover pediatric, preventive dental care — but no such requirement extends to coverage for adults. That leaves adult dental coverage options inconsistent and dependent on a mix of state policy decisions and state-by-state insurer offerings. According to the Kaiser Family Foundation, only 15 states offer extensive adult dental coverage through Medicaid (Maine is one of 13 states that cover emergency-only benefits). In Maine, adults with Medicaid can receive coverage only for dental emergencies, such as tooth extractions, which are generally needed only after manageable dental problems have developed into major — and expensive — health issues. The medical consequences of a lack of dental care are clear. A 2010 study of emergency room use by the Muskie School of Public Service at the University of Southern Maine revealed that dental disease was the top reason for someone age 15 to 44 with MaineCare or without insurance to seek emergency room care. But, dental care isn’t just about health. It is also about economic viability. In a 2015 survey by the American Dental Association and Health Policy Institute, nearly half of the low-income respondents in Maine said their teeth and mouth were in only fair or poor conditions. Thirty-seven percent of low-income Maine survey participants said the condition of their teeth affects their ability to interview for a job. A third of Maine adults said they avoid smiling because of the poor condition of their teeth. Extending health insurance to cover dental care makes sense. Maine should join the other states that have made this logical change.